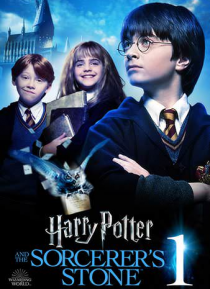 Based on the first of J.K. Rowling's popular children's novels about Harry Potter, the live-action family adventure film Harry Potter and the Sorcerer's Stone tells the story of a boy who learns on his 11th birthday that he is the orphaned son of two powerful wizards and possesses unique magical powers of his own. Invited to attend Hogwarts School of Witchcraft and Wizardry, Harry embarks on the a… dventure of a lifetime. At Hogwarts, he finds the home and the family he has never had.